I should probably patent this before I reveal it to the public… but well, that seems like a lot of work. So I will instead choose full disclosure and you business tycoons can run with it. When I first arrived at PAN, my immediate first thought was. Wow!!! We have some serious sensory processing issues up in here. A quick explanation (all you therapist types reading this… feel free to skip to following paragraph) What the heck am I talking about? Well, kids in these types of situations typically lead either (or both) a. very unstimulating lives b. very unpredictable lives. These kids may spend hours in a small room with few toys, little time out of their cribs, little personal attention from adults. They may also have led very difficult lives prior to coming to this institution including neglect, abuse… things no one, especially a two year old should have to deal with. The results of this (and of course some other variables like genetics and/or in utero exposure to drugs) can sometimes lead to major difficulties processing sensory information. The kids have problems turning up/ turning down sensory information. An example I like to use is: have you ever gone to vitamin cottage (or the likes) and tried to find a specific vitamin on the IMMENSE wall filled with vitamins. It is totally overwhelming– I usually either give up, find a salesman…. but always get a little irritated. For these kids “simple tasks” like attending to the teacher’s instructions can be really difficult when the tag on their shirt irritates them and overwhelms them as much as the vitamin cottage wall overwhelms me. They physically can not regulate themselves. It makes the world a very scary and confusing place. A particularly challenging time for some of these little dudes is nap time. Several of my buddies are the sensation seeking type. They NEED stimulation, seek it, search for it… all the time. They are the type of kids who won’t lay still— keep rocking their legs or repositioning. They sit-up and look around at EVERY noise someone else makes. Before you know it they are rubbing the hair of the little girl next to them. And so on…. It took them over an hour to fall asleep. Which means they sleep about half the time of all the other kids. Which means they are tired in the afternoon. Which means this is a VERY endless cycle. So I immediately thought of a weighted blanket for these kids. This input all over their body (theoretically… I was crossing my fingers that this would actually work as I told the teachers about it) will provide the stimulation they need and with a few other calming techniques, they might just be able to relax and fall asleep in a typical amount of time. So, weighted blankets a great idea. Next… how the heck was I going to get a weighted blanket. Of course you can buy them, but like all “medical supplies” they are ridiculously expensive ($50-$200+ according to my internet search). I however was able to make them for around $7. Yeah, I know… I am amazing 🙂 Basically you take a pillowcase, sew in some panels, fill every other one with rice. And you end up with a perfect size “blanket” for a 3-5 year old that molds to their body. I introduced the blanket to my buddies in therapy sessions first so that it was not a huge deal when I brought it in the room at nap time. Victim #1 Jacobo. almost 4 yrs old. day 1- put the blanket on him, gave a little shake on the bum: 30 minutes he was alseep. And we did not have to tell him for than 5-6 times to be quite and go to sleep. By the second week, it was about 15 minutes (the same as all 30 of the others kiddos) and only a few reminders to keep his hands to himself. Jhordi and Louis Angel also responded about the same. 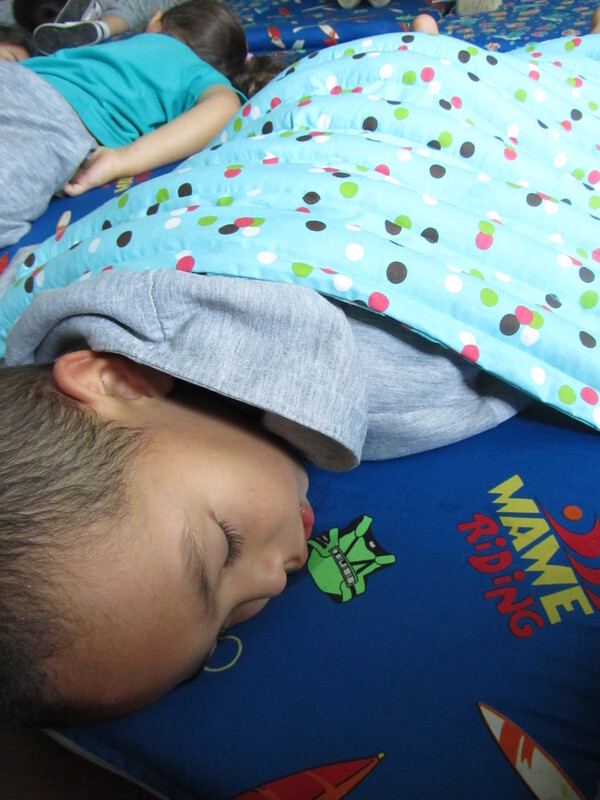 After a couple of weeks, we even started just passing the blanket around to whichever kids were still awake…. worked like a charm. Casa de Maria: We had a novena (Catholic pre-christmas party basically… google it if you want the dets) with the kids at Casa de Maria. Raul, Nora and Blanca Ines (Gladney peeps) put on a fantastic party for the kids. There was a choir, a clown, HUGE hotdogs, and lots of smiling kids. It was really cool. I am loving my time there because it is really different from PAN. I am working with the little guys here (mostly under 3) who have delays. And nothing makes me happy quite like playing with cute little babies. Christmas is fast approaching! Safe travels. Happy holidays and you know… all that other christmas cheer. Hi, there. I’ve just read all your posts. What amazing experiences you’re having. I agree that you’re a really good writer. and a pretty good dancer. Merry Christmas. Maybe the young hansome American could be interested in the nice, wonderful blond woman I’m thinking about this minute. The wweighted blanket is a very creative new kind of quilt! I’m really into that idea, may even try it for my back. Miss you but God bless.